If this website was of help to you, I would definitely appreciate any contributions through Paypal to keep this FREE educational website going. It does cost money to keep it going & I know many dealers around the country utilize this site as a resource yet most do not support it. Please just use the link below. Thank you! Admittedly COA's have become a big business for some & many should have been written on toilet paper & signed by their dog's paw print on an assembly line. I've seen some that even had the signature photocopied or notarized by a wife but never signed! Virtually anyone can buy a microscope & call themselves an authenticator, it is up to you to determine who is truly knowledgeable or just fleecing collectors. Just like there are fake items there are fake authenticators. Look at the details of their 'paper'. If it just has a length & a thumbs up then chances are its an assembly line COA. I generally restrict myself to tomahawks or those historic items I am thoroughly familiar with since that is what I know best. I don't do them at shows. I don't do prehistoric items. I never want to do this in a high volume like many which allows me to be more detailed, thoughtful, careful & independent of other dealers or groups. I don't have backroom deals with other dealers or authenticators that can color an opinion (although I've had invitations). Its daunting enough to be expert in all types of tomahawks or historic items but to presume any one person is expert in all types of artifacts from all regions and from all time periods is incredibly unrealistic! There is far too much to know. I do authenticate other historic Indian items but certainly not all so please ask & I will respond. Its far more important for me to be accurate & thorough than to make money at it. Due to overwhelming requests for free authentication services, I can no longer respond to emails requesting it. Many contact me saying they don't really need an authentication-- they just want to know whether its good or not. lol That IS an authentication. I get daily requests to do this for free. Some don't want to pay me unless it works out to be authentic. That is not how it works either --& would you really want any authenticator motivated to say they are authentic so he is paid? I make no money sharing what I know on this website (actually it costs me money) & did it out of my desire to educate & help others avoid costly mistakes. I've spent a lot of time, money & effort to learn what I know. A former authenticator once told me "There is no occupation where you risk disappointing and/or angering so many people - for so little money - as authenticating." So true. I do offer the service of a Certificate Of Authentication (COA) for $25 ($40 for pipe tomahawks, Missouri war axes, etc.) plus return shipping cost. http://postcalc.usps.com/ It requires that the tomahawk be sent to me so I can personally examine it & will include value, condition, precise measurements, sources and history. COAs cannot be done via email photos. I no longer include details of why or why not it is authentic since this kind of information can get back to the fakers who then learn to improve their techniques. The COA is based on my 22 years of experience, experimentation & study with metallic tomahawks and 31 years studying antique axes/tools of the world. I examine it under varying light conditions with a digital microscope up to 220X. COA's may be of value when insuring your collectibles. Whether any independent 3rd party authentication can increase it's value is debatable, and doubtful. Most people are simply interested to know what they have. Please ensure your item is fully insured and packed well-- not responsible for any loss/damage incurred during shipping. So far luckily none to report. I certainly understand most don’t want the expense of a round trip too. In many cases I can make determinations from the photos alone though I still always prefer seeing them all in person. I can give you an unofficial opinion based on your photos if you like for $20 ($30 for pipe tomahawks & war clubs), as long as it is understood this is generally a less reliable method & could result in error. If I am unable to form a definitive opinion from the photos I will refund your money. The response won't be a COA but rather an email opinion. Please don't send me out of focus iphone pictures with no dimensions or too far away to see anything. I need focused ones preferably from a camera --i.e. at right angles to it, top view underside view, the whole thing and close-ups & dimensions. Use a plain background & good lighting around it if possible. If you choose this option but later decide to send it to me for an official COA I only charge $5 additional for it ($10 for pipe tomahawks). A PayPal link is at the top of this page where it says "Donate" or I can send an invoice. Please fully insure all items shipped to me for authentication. I recommend getting signature confirmation. Not responsible for losses that occur in the mail however I will of course help in any way I can if it ever does occur. So far I've had no issues with shipping. I will pack carefully or better than when it is received. Qualifications: Collector/ dealer of Fur Trade Period artifacts for 24 years; 35 years collecting antique axes & tools; 10 years as professional tomahawk authenticator; researcher of over 2,000 tomahawk marks & makers; articles published in The Tool Shed publication, NJ., Ohio Journal of Science, Central States Archaeological Journal, etc; Bachelor of Science Degree, KSU. Research advisor to auction houses, film producers & the National Museum of the American Indian/ Smithsonian Institution with their 700+ axes & tomahawks. I hope I've made a difference and that fewer people are taken advantage of than before. Some will learn things they didn't know before & will want to learn more. There is always more to learn. Perhaps some that never thought of collecting will be encouraged to. Having muscular dystrophy I don't get out as much as I used to but helping others in this way is reaching more people than I had ever hoped for. For that I am very grateful. I'm kind of an art forensics guy myself (but with fine art instead of decorative arts) and the iron insert bothered me most of all. It's a good a piece of metalwork as it is, but it looked way too evenly pitted for my experience of the 250 year old ironwork I've seen. Your observations are intelligent, tied to the facts, and right to the point. Thank you so much. ...IT APPEARS THAT THE ''FAKING'' OF PIPE TOMAHAWKS IS BECOMING MORE COMMON AND HARDER TO TELL THE GOOD FROM THE BAD. THE SAME WITH TRADE SILVER. YOU HAVE A GOOD EYE AND I VALUE YOUR OPINION AND ADVISE OTHER COLLECTORS OF YOUR EXPERTISE. 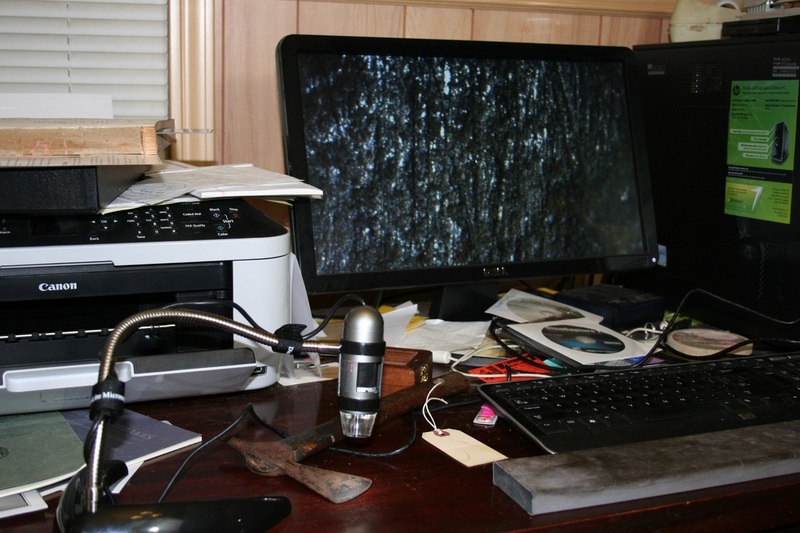 I found your website while searching for information about a blacksmith mark on an Axe I recently bought (at a yardsale in NH). I am not sure if you take questions, but have you ever seen the mark CMCO on an axe? It is a rectangular stamp in the metal on all surfaces of the axe (which is double-headed). I have checked some of the resources that you list on your site with no luck, I have a few requested through Inter-Library Loan as well. Thank you, if you have any information on the mark. And Thank You for taking the time to produce such an interesting and informative website. Hi Mark, thank you, that is very useful information. I suspected they weren’t genuine. We’re not in the market for anything like that unless it’s authentic Florida Seminole. The seller claims the bow belonged to Micanopy, and I seriously doubt that. Thank you so much for investigating them and giving us your expert opinion. I will let the committee know what you said and I really appreciate your effort and time. Thanks for your efforts in this matter. A neat history which I am sure will be of great interest to my grandson. I am most appreciative of your information and the professional manner in which it was done. Wow, excellent COA. Very professional and very detailed. I appreciate your expertise and your extra help above and beyond the call of duty. ......Please keep up the good work! I can’t thank you enough for the sound advice, experience, and wisdom. This has been a true pleasure for me to correspond on this topic with you Sir. Thank you. "Facts are stubborn things; whatever may be our wishes, our inclinations, or the dictates of our passion, they cannot alter the state of facts and evidence."